There is an easy way to distinguish most abrasives commonly used for blast cleaning. On the one hand, there are recyclable abrasives, which tend to be higher in cost, and used in inside factory environments. On the other hand, there are expendable abrasives, which tend to be synthetic minerals, lower in cost and used in outside environments. Another way to categorise abrasives is by whether they are metallic or non-metallic. This grouping seems to make a little more sense because most abrasives will recycle. For example, there are plenty of users recycling iron silicate based abrasives, which are normally considered expendable materials, while there is technically nothing wrong, with recycling expendable abrasives, the number of passes is more limited compared to recyclable abrasives. Further more ISO divides its standards on abrasives in to metallic and non-metallic categories, the ISO 11124 and ISO 11125 series of standards deal with specifications and test methods, respectively for metallic blast cleaning abrasives, while ISO 11126 and ISO 11127 are the corresponding series of standards for non-metallic abrasives. Therefore, this article describes various types of metallic and non-metallic abrasives commonly used for surface preparation in the protective and marine coatings industry. It presents characteristics of each type along with information about its most likely application. The article begins, however, with a brief run down of the various factors, including hardness, specific gravity, and particle size, that would be considered in answering the question: what type of abrasives to use? One way of identifying whether abrasives are suitable for a specific cleaning process is to look at their relative hardness according too the Rockwell scale for metallic abrasives and the Mohs’ scale for non metallic abrasives. Table 1 lists the relative hardness of various abrasives discussed in this article. The larger size of the hardness range for the metallic abrasives reflects the fact that they can be heat treated after casting to change their hardness. 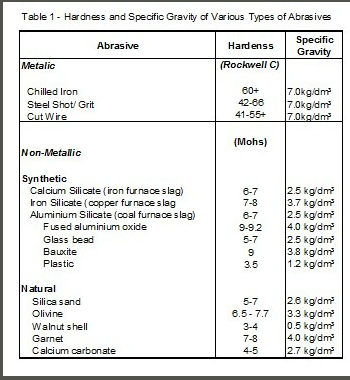 Table 1 also identifies the specific gravity of the various abrasives. Cleaning efficiency is determined by the energy impacted by the abrasive to the surface of the substrate. This is due to the physical law of kinetic energy: E= ½ mv2. In this formula , E is energy; v is velocity of the abrasive particle; and m is the mass of the abrasive particle, which is proportional to its specific gravity. The most efficient and fastest cleaning is achieved by abrasives with the highest specific gravity. Several points can be made about velocity, the other factor in the equation, and about nozzle pressure, which determines the velocity of the abrasive. Most abrasives will fracture upon impact at nozzle pressures above 100 psi (7 bar), which typically produces a velocity of 450 mph (depending on the size of the nozzle, etc). When an abrasive breaks down, energy transfer is reduced. Pressures above 100 psi do not add a great deal to the performance of the abrasive. The main advantage of very high pressures is the speed with which blasting can be done. The table does not include another important variable in abrasive selection- the particle size. The most efficient abrasive will be the finest abrasive that will remove the coating and give the required profile. If the abrasive is too fine or too coarse, its efficiency is minimised. Ideally, whether the abrasive is metallic or non- metallic, a mix of particle sizes gives the best performance and the best surface finish. Most recyclable abrasives are supplied in a narrow size range, since the recycling process will produce the working mix. The purchaser should select the size range that will not only remove the coating initially but will also be a good size to add into the recycled mix to keep it efficient. Expendable abrasives that are used only once are sold in working mixes (usually 0.2-1.8 mm). Having considered hardness, specific gravity, and abrasive particle size, the next key decision is wether to use a metallic or non- metallic abrasive. This decision is often determined by the substrate, particularly its location, size, and material with which it is made. Following are a summary of the primary metallic and non-metallic abrasives and suggestions about where they should be used or not used. The main characteristic of metallic abrasives is their ability to withstand repeated impact. For this reason, they are most often selected for cleaning applications where recovery and reuse of the abrasive is possible. The most widely used ferrous abrasives are the cast type. The other way metallic abrasives are made is by mechanical processing. The two categories of cast ferrous are those made of iron and steel. Cast iron abrasives are supplied in angular grit particles, they contain hard iron carbides and since they fracture in a brittle way upon repeated impact, they clean rapidly by a cutting action, similar to that of a slag abrasive. Cast iron abrasives are predominantly used in compressed air blasting equipment, and labour is the predominant cost involved with this method – far more than the cost of abrasives. The condition of the equipment and blasting skill of the operator have a major effect on the overall process cost. Steel abrasives are available in high carbon and low carbon content, although their cleaning performance is comparable, there are some differences in their characteristics, compared to high carbon steel, the low carbon steel abrasives, which are normally supplied at cast shot, offer up to 20% longer durability because of their tendency not to crack and their relative softness, also, they cause less wear on blasting equipment. However, high carbon steel are still the most commonly used, they are supplied in both shot and grit particle shapes. The particles are heat treated to produce either a martensitic or a bainitic structure for a good combination of hardness and durability. Martensite is a very hard brittle particle produced when hot steel is suddenly chilled by cold water. Abrasives with bainitic structure are similar to low carbon marensite; they are formed by not allowing the steel to cool below 380º until they are solid. Because of their sharp, angular structure, grit particles are particular effective for surface cleaning. Grit comes in various harnesses, and the harder the grit the better its cleaning ability. However, grit eventually becomes rounded in form, and it generally has a shorter life than shot particularly the harder it is. Steel shot abrasives are pre-dominantly used in impact wheel-type blasting equipment. They clean by hammering action. The profile they produce is much rounder then that achieved by similar shot of iron abrasives. The most common type of metallic abrasive produced by mechanical processing is cut wire. Lengths of scrap or sometimes even new wire are chopped to the same measurement as its diameter. Despite its low production costs, cut wire abrasive has excellent cleaning rates where an aggressive abrasive is required (e.g. cleaning very rough foundry castings). Non- Metallic abrasives include natural and synthetic materials, silica sand, flint, olivine, and staurolite, garnet, calcium carbonate, and vegetable products such as walnut shells and corn cobs are all type of natural abrasives. Historically, natural abrasives were available before the development of synthetic abrasives, which include iron silicates, aluminium silicates, calcium silicates, aluminium oxide, sintered or calcined bauxite, glass beads, and plastics. Silica sand is a very good abrasive. It is hard, gives a superb finish to almost any substrate, is available almost everywhere in the world, and is generally the lowest cost abrasive. Drawbacks are that it is not always available in large particle sizes; it can be recycled only a few times; and it poses significant health risks for workers. Silicosis, a chronic lung disease marked by diffuse fibrosis (scarring) of lung tissue, is caused by breathing silica dust, which is created when silica sand abrasive breaks down upon impact. Exposure to very high concentrates of silica dust can cause acute silicosis, resulting in rapidly progressive breathing problems and even death within a few months of onset. More common is progressive silicosis, usually from exposure over a long period, which may develop into lung cancer. The effect of silicosis continues to develop after exposure has stopped, and it is irreversible. There is a misconception (at least in the UK) that blasting with wet sand can stop the effect of silicosis. However, there is evidence that silica sand suspended as a hydrosol (i.e in water) can penetrate the respiratory track easier then an aerosol (i.e. in air). So although blasting with wet sand will initially keep the dust down, it will not repress it to the maximum exposure limit of 0.3 mg/m³ expressed as an 8-hour time-weighted average. The UK Health and Safety Executive, which has established these exposure limits, has determined that even general cleaning after blasting by sweeping dry silica sand will produce a maximum exposure level of twice the legal limit and that internal blasting of fresh water tanks on a ship with silica sand produced potential exposures of almost 2,000 mg/m³ of respirable dust (more that 6,000 times the permitted limit). Staurolite, a dark coloured mineral that is a silicate of aluminium and iron, has some free silica content but much less than silica sand. It is marketed in the USA, where it naturally occurs, as an alternative to silica sand, in Europe, olivine, which is quarried in Norway, is marketed as silica free sand. It is a silicate if iron and magnesium. Olivine, which is pale green, is often used to clean buildings. It is also sometimes specified for non-ferrous substrates instead of synthetic abrasive. Olivine is very hard but tends to fracture on impact, creating lots of light coloured dust. Both Staurolite and Olivine are relatively high-priced abrasives in most markets due to their limited geographic availability. Garnet is a hard silicate mineral quarried in Australia, India, USA and South Africa. As an expendable abrasive, it is more expensive than some other materials, but its high cleaning efficiency means less abrasive needs to be used. Hence, not only the cost of abrasive per square metre but also disposal costs can be reduced. Consequently, any cost comparisons with other abrasives should be done on the basis of cost per square metre. Garnet can also be used as a recyclable abrasive, and as such, it has found use as a less expensive alternative to aluminium oxide. Similar to Olivine, Garnet is used on both ferrous and non ferrous metal substrates. Its low dust quality is an attractive feature in environmentally sensitive areas. It also has excellent cutting properties, which make it good for water jet cutting. Garnet has the highest specific gravity of all the natural and synthetic abrasives commonly used on site. This explains a lot of its popularity because, as noted, high specific gravity is a benefit for blasting efficiency. In addition, garnet has a high bulk density, which means it has more weight per cubic metre than other abrasives. The benefit of high bulk density, is that more can be stored in less space. In its natural state, garnet has relatively high content of soluble salt. Nowadays, however garnet that has been properly washed and processed by reputable suppliers has soluble salt concentrations within or slightly above the guidelines set by ISO 11126. This natural material is a white powder or a colourless, crystalline compound found in limestone, among other places. It is very soft, and for this reason, it is mainly used for cleaning stone or thin-panelled alloy structures. Occasionally, it is an inexpensive substitute for bicarbonate of soda abrasive, since the finer grades of calcium carbonate are partially dissolvable in water. Calcium carbonate is available as a food grade, so it can be used for blasting in some food and brewing applications. These abrasives are made from walnut shells, olive stones, peach stones, corncobs, processed wheat into a starch and palm kernels. Except for palm kernels, they are very soft, and they generally are used for polishing or for deflashing in vibratory finishing machines. Sodium Bicarbonate, also known as baking soda, is a soft, white, crystalline powder that is an alkaline, water-soluble chemical. As a blast cleaning material, sodium bicarbonate is available in different particle sizes, It incorporates flow agents and other additives to enhance its performance. It has been used for dry blasting or wet blasting operations, particularly for cleaning sensitive areas, such as those found in aerospace industry. However, its alkalinity has been known to cause corrosion on aluminium alloys if it is not been properly removed from the substrate after being blasted. Iron Silicate, more often referred to as copper slag, is the most widely used synthetic material. It is available in most countries since it is a by-product of copper smelting. Despite common misunderstandings that these abrasives are toxic, they are not if they are manufactured correctly by quenching the slag from a molten form quickly into a bath of moving cold water, then the heavy metals contained within the abrasive are bonded as tightly as the lead in lead crystal glass. The complex matrix of the material generally means the metals contained are not there as free metals, and this is the case with all synthetic abrasives. Table 1 shows that iron silicate abrasives have the highest specific gravity of the expendable synthetic abrasives. (Bauxite’s specific gravity is higher, but it is generally recycled). This helps to explain why iron silicate is used in preference to other synthetic abrasives. In addition, iron silicate is available in a wide range of particle sizes, which can be quite useful for removing very tough coatings such as chlorinated rubber that require the use of large particles. A drawback of iron silicate, which is black, is the black dust it creates when blasting. This can be countered to some degree by methods of incorporating water into the blasting process. Iron silicates leave substrates very dark, and although an Sa 3 surface can be achieve with theses abrasives, many specifiers prefer a lighter coloured abrasive on non-ferrous substrates, particularly if they are to be left uncoated. This abrasive is a by product 0f power stations burning coal in a furnace. The hot slag is tapped off of the furnace and quenched in the same way as iron silicate abrasives. There is a lot of variation among aluminium silicates produced from different power plants because of difference in the quality of coal that they burn. Aluminium Silicates generally are used close to where they are produced because of the cost of transportation. The major production area in Europe is in Germany. Like iron silicates, aluminium silicates are used mainly for cleaning steel. However, because of the light coloured substrate left after blasting, they are commonly specified on non ferrous materials and even sometimes on stonework. Calcium silicate is the by-product of iron smelting. It is a very versatile abrasive, used on virtually any substrate. Finer grades of calcium silicate replicate the colour and performance of silica sand. It has quite a few niche applications, such as removing the gel coat from glass reinforced plastic boats, cleaning brickwork, exposing the fine details on ornate stonework, and cleaning wood. In addition, of all the synthetic and natural expendable abrasives, it contains the lowest amounts of metals thought to be harmful to the environment. Aluminium oxide is generally used in brown form, but refined grades of white and pink are available which contain very low free iron contents (often below 40 ppm). This abrasive is available in a multitude of grades. Its main use is as a recyclable abrasive in cabinets, However, it is generally more expensive than metallic recyclable abrasives, and it will not recycle as many times, particularly the white, which is very hard. Since it will not corrode and go solid in the blasting equipment, it is very suitable for use where the work is intermittent. Because if its very low iron content, aluminium oxide is often specified in high-tech applications, such as the aerospace industry, particularly on non-ferrous metals. It is also commonly specified on stainless steel when the substrates is going to be immersed into sea water, because it lessens the chance of an electrolytic corrosion cell setting up between any abrasive left in substrate and the stainless steel. Abrasives made from bauxite, a clay – like ore of hydrated aluminium oxide, are often used as alternatives to aluminium oxide because they are cheaper. The abrasive is produced by heat-treating natural bauxite without melting and fusing it (as in the manufacture of aluminium oxide). Sintered bauxite shot is used extensively in memorial masonry trade for lettering gravestones. Calcined bauxite, which is available as a grit, is used in most low-tech applications where aluminium oxide is used. Glass bead abrasives are small, spherical white glass particles mainly used for peening applications or polishing substrates because they can in finer form produce no profile. This abrasive is particularly useful for decarbonising engine components or cleaning turbine blades where dimensional stability must be maintained. Glass grit abrasive is available as a primary grade that is produced from crushed beads or as a secondary grade that is produced from recycled safety or reinforced glass. Drawbacks of grass grit are its softness and its price relative to other abrasives, so it has few uses as a primary grade other than in conjunction with glass bead where a profile is required. Recycled glass grit is becoming more popular, it is cheap as the raw material has come from the waste stream and quite versatile as it can be used on most substrates. The disadvantages are that it is soft so it breaks down quickly and can produce a lot of dust. One other disadvantage is that it leaves a highly reflective substrate due to the embedded glass grit, which can be multicoloured due to the raw material source which tends to be mixed coloured glass. Plastic abrasive is used extensively in the aerospace industry where it has virtually replaced all chemical strippers. This is also likely to happen in the masonry cleaning industry because of growing controls on disposal of chemicals in local sewers. Plastic abrasive is generally made from plastic off cuts, usually the acrylic thermoplastic (type 5) kind. It has very low specific gravity and hardness, and it must be used in specialised equipment because of its poor flow characteristics. If used correctly, plastic abrasive will remove difficult coatings without damage to delicate substrates such as titanium, aluminium, and anodised and cadmium-plated surfaces. In addition to these abrasives, there are speciality niche materials that do not fit into any category. An example is sponge abrasives, which are impregnated with many different types of other abrasive materials to give them “biting power”. Abrasive blasting has proved for years to be a cost-effective way of cleaning and profiling substrates. While the abrasive industry must continue to look at new innovative materials, it must not loose sight of the cost of abrasive cleaning or ignore less expensive, traditional abrasives because they are not fashionable.